Instagram today announced the third version of its extremely popular mobile photo sharing application, and took a major step forward towards solving the consumption conundrum. If the first version of the app was essentially an introduction of mobile-photo sharing and use of filters, the second version of Instagram was all about making the experience better, faster and simpler. With this new and third version, Instagram has spent most of its energy on the continuous consumption of photos and stories behind those photos. 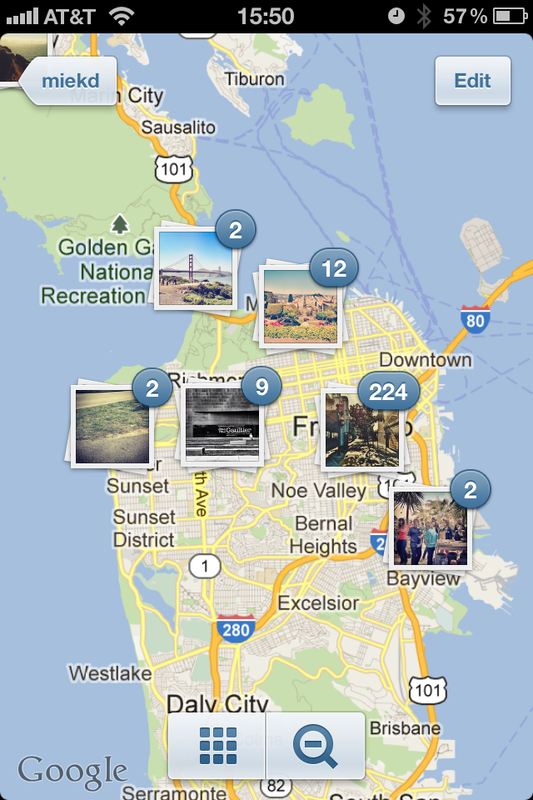 The newest version of Instagram is pinning its hopes on geo-tagging, which is masked in a feature called Photo Map. And with this release, the company might have taken a first tentative step towards a unique business model. In the new version you can select photos you wish to make public and they get pinned to a location. For instance, if you have ten photos from Helsinki, Finland, they all get clustered together. These clusters are visible as collections on a map. You can see many collections on the map and can tap to zoom in (or out) to get a closer and more contextual view. There are other improvements in this release, such as a new look for user profiles, the Explore tab, hashtag and location pages. The photo upload screen has been upgraded and ability to fight comment spam has been made more granular. Photo Maps allows you to showcase your photos on a map and also see other user’s maps as well, as long as those are approved by the other users. The list is too long and Instagram’s blog post has more details. Don’t worry – there are massive improvements in the actual service as well. For instance, your photo feed loads about ten times faster than the older version. There is unlimited auto scrolling and the photos load much faster than in the past. But the real magic is photo consumption. He argues that we often remember places we have visited. For instance, a trip to London or Berlin or New Delhi is something we remember, even though we might forget some individual memories. It is one of the reasons why Instagram has bet on using geo-data as a way to discover photos. Instagram CEO/co-founder Kevin Systrom shows off version 3.0. What Instagram is offering isn’t novel. In 2007, the pioneering photo sharing service Flickr had launched a global map-based visual navigation. They wanted to replace search with discovery and Instagram is going in that direction as well. On mobile, text-based search is not an easy option. Instagram wants to use device’s built-in capabilities to help with discovery of the photos. And they are starting off with geo-location. Of course, normal people don’t care about geo-location. But tell them how it will help them go back into time and share memories, and they are going to buy into the whole geo-location. Instagram’s approach: keep it simple. This focus on keeping things dead simple is one of the reasons why Instagram has gone from zero to over 80 million members in less than two years. Facebook is buying the company for hundreds of millions of dollars, if the regulators approve the merger. But more importantly, Instagram has become the most popular way of sharing photos on the mobile phones. They tart up their photos and comments using an array of 3rd party apps like Versagram, PicFrame, Emoji. It’s a ping to let your friends know you exist, and what your doing; and you hope for a “like” (a ping back) to let you know you’re not alone on the network. Of course, this is what we’ve all been doing with Instagram. We’ve just been under the illusion we were sharing photos. Seeing the behavior of these 13-year-olds made that clear to me. We’re not using Instagram to make art. Or to hone our craft as photographers. It ain’t Flickr. We’re just trying to connect with our friends, to start a conversation. Instagram is really a communications platform disguised as a photo app. Social platforms have always been about communication. Instant Messaging, Blogs, Facebook, Twitter – they are essentially platforms of communications. Sometimes that communication is a smiley face, a blog post, a poke, a retweet or a like. Photos too are an atomic unit of emotion and communicating that emption. “Photos without metadata are just photos, but with metadata you can start to do very interesting things,” added Systrom. “You can tell the story of your life or events.” The photos created by a smartphone’s camera are packed with metadata and it helps the company start arranging the photos in different ways and encourage new behaviors. As the number of photos shared on the network increases, Instagram now has an opportunity to view and offer a view into what is happening around the planet at any given moment. The Olympics in London or Oktoberfest in Munich – Instagram hopes that one day it will be able to surface photos of such events by a proverbial swipe. Systrom cautioned that we shouldn’t get too carried away. “We are creating a signal and hopefully in the future we can surface events or news happenings,” he said. The challenge of course is that Instagram is increasingly populated by folks in their teens and I wonder if they will care as much about telling the story of their life as well some of us old farts. Systrom argued that Instagram has more than teen-members and more importantly, even they would like to share their summer stories and special moments with friends. As the company starts to arrange photos into collections based on locations or events, it also can start to create an opportunity to inject sponsored photos (sponsored stories if you may) and start to think about revenues – something that had eluded the company thus far. A recent report by Simply Measured, a Seattle-based social media research company pointed out that nearly 40 percent of the Interbrand 100 are already on Instagram. These brands could find ways to create new engagement behavior and redefine brand advertising. Of course, all that is in the future – for now, Instagram is hoping that people love the new features. I have the same problem i write a comment and it just automaticly goes away and other people cant see my comments and neither can i so ANNOYING!!! I have the same issue!! On my IPHONE! Bothe my and others comments/likes disappear!! I am also having the same problem my photo comments just disappeared when I refresh or reload the photo, its been happening to me for a while now since I got the new version of instagram, does anybody know how to fix this? Does anyone possibly have any news on this? I am ALSO having the same issue as of yesterday – replies/comments on my own photos disappear after a few seconds. Extremely annoying. I tried downloading an Instagram update and restarting my phone but it didn’t help. I’m an Android user, my friends who all have iPhones are not experiencing this issue. Is there a bug with the Android for Instagram version or for both? How do i go back to my old instagram 2.0 i dont like the new update. Please help. Many instagram users tell me they have the same problems ! Does anybody know if INSTAGRAM is aware of it and are they doing anything to fix the problem ? This morning again all my photo comments disappeared within an hour. I had to do them again. Please INSTAGRAM remove the bug and submit a corrected update version . omg what should i do?? i miss 4 comments they disappear and im confused whats wrong with yoou stuff? i need help come on ! nnnnnnow!!!!! After reading you, I seriously feel, Instagram would give competition to Twitter. Is there any better way, Twitter could give counter to them? I’ve been ignoring Twitter’s inline photo sharing service, seriously I don’t like it instead I use Twitpic and Instagram, and tell my story. Twitter has ignored some of the core things for so long that it makes me wonder what are they doing out there. I feel the company is not understanding the communication aspect of photos as well. the 21st century equivalent of drums in the forest, in relation to actual communication. Not sure what you mean but I would not be so dismissive. As an IG’er with 2500+ photos, the option to migrate all geo data, delete all geo data, or check/uncheck each photo on the iPhone during only a single session was daunting. I ended up deleting all the data, regretting it, but seeing no better way to not geo tag the inside of friends’ homes, my home during GPOYW’s, and similar things. I wish there had been some middle ground here of multiple session support to enable/disable, support for a larger web browser interface to make the process of going through 2500+ photos quicker, or something. I was very mad, sad and frustrated with my options and ended up pulling the geo-suicide trigger.